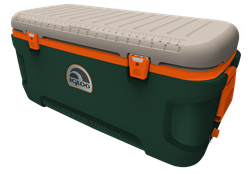 Igloo Products Corp., the nation’s largest cooler manufacturer, has expanded its Super Tough and Super Tough STX lines to include new sportsman colors. The line also features a newly re-designed body shape. The easily recognizable blaze orange liners will remain the same and will be paired with dark tan or hunter green bodies with light tan lids, in three different sizes – 54-, 120- and 150-quart. The easily recognizable blaze orange liners will remain the same and will be paired with dark tan or hunter green bodies with light tan lids, in three different sizes – 54-, 120- and 150-quart. The additional color choices are aimed at hunters and other outdoorsman who prefer natural colored coolers to bright white. All Super Tough and Super Tough STX’s will maintain all of the same product features such as 30 to 40 percent thicker shells, bolt-through handle system with back-up plate, and anchored hybrid or stainless steel hardware; plus they will have the new contoured body design. The new colors and body shapes will be available at retail in the fall of 2013 with MSRPs ranging between $69.99 and $189.99. For further information about the Super Tough series or about any other Igloo product, contact Katie Davis at KDavis(at)igloocorp(dot)com or visit the company’s Web site at http://www.igloocoolers.com.